Saturdays are big days at the John E. Kushner Restoration Pavilion, the constant sound of tools and laughter fill every space within the building. There are about 30 volunteers climbing all over PT-305, working hard and enjoying every minute of it. Part of the fun on February 11, 2012, was using a tool in a manner it was not commonly used for. A wood planer is a tool that finishes and smooths the surface of wood, it is faster and more uniform than sanding a large piece by hand. Usually a flat board is fed into the planer create a smooth surface or cut the board down to the desired thickness. 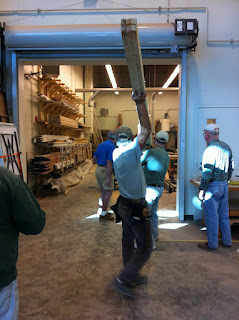 That Saturday, Frank and his crew were feeding a board through that looks like an elongated corkscrew. The scene was quite impressive, five men holding onto a board that was hopelessly crooked. Conrad even had to stand on a ladder because the board bends so sharply it’s the only way he could hold the end up. So why would we be putting such a strangely shaped board through the planer? The answer is that it is a very important component of a boat’s structure called the sheer. The sheer is the board that makes the intersection of the deck and side hull on a ship. It runs the length of the ship on both the Port (Left) and Starboard (Right) sides. On the 305, the sheer is a roughly 4 x 4 piece of pine. It took a week to build this piece of PT-305, and this piece was just one half of the forward part of the sheer. During the war at the City Park plant, where Higgins built PT boats, there was an entire mill dedicated to prefabrication of PT boat components. Once parts were completed in the mill, they were stored on the production line, at the point at which they would be installed. This assembly line production was one of the reasons that Higgins Industries could build a PT boat Hull in roughly one month. It’s not that easy with the restoration of PT-305. Each major part of the basic structure takes time to build. 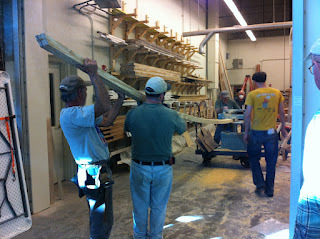 Away from the boat, in our own little “mill” we call the wood shop, component manufacture continues. That Saturday in the wood shop, work continued on lower hull ribs – ribs for the bottom of the boat, and deck ribs – the ribs that hold the deck up. Both of these ribs are glued out of strips of wood with a two part epoxy in order to create a curved piece of wood. The deck ribs are being built in the same manner as the original ones, long strips of wood glued together to form a curve that matches the curve of the finished deck. The hull ribs follow the same process, except when they are complete they receive ¼ inch plywood lamination on both sides that create deck ribs that are far stronger than solid pieces of wood. Nothing is easy on the PT-305 restoration, it takes 12 hours for the glue to set up, many more hours to create jigs, cut and prep wood to assemble into the main structural components. With most of the basic structure in place, other crews could begin new tasks. In the lazarette, the last compartment in the 305, Kali continued the process of finish painting. The finish paint provides an essential layer of protection, keeping water out of the wood, and must be applied properly before further fitting out limits access to the compartment. While the external parts of the boat will be painted with spray guns, the inside will all be hand painted. In the engine room, the steel crew, led by Jim, carried out the task of installing all the reinforcements. These are aluminum plates that exist mainly in the engine room. Their primary purpose is to hold the weight of the 3 Packard 4M-2500 engines and assist in the transfer of energy from the propellers into the structure of the 305 while it is under way. With the installation of these reinforcements the next big step can be made, installation of the mounts. Keep up with the PT-305 project with regular volunteer updates. You can also send them your questions and comments at PT305crew@gmail.com. Read related PT-305 blog posts. Find out more about the history of PT-305. Find out more about the John E. Kushner Restoration Pavilion. Anyone who has ever visited the Museum has probably marveled over the beautifully restored LCP(L) on display in the Louisiana Memorial Pavilion as well as the fully-functional replica of a LCVP (both boats manufactured by Higgins Industries of New Orleans during WWII). Visitors have also toured the John E. Kushner Restoration Pavilion (or perhaps just pressed their faces up against the exterior glass!) to see ongoing work to restore a Higgins-built PT boat, PT-305. But what visitors may not realize is the long-standing relationship between the Museum and the dedicated group of volunteers who made these projects a reality. This special group of volunteers has been giving their time to the Museum back before the original National D-Day Museum even opened. Stay tuned for more volunteer updates on the Museum Blog.